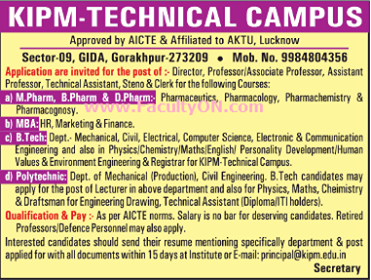 KIPM - Technical Campus, Gorakhpur has advertised in THE TIMES OF INDIA newspaper for the recruitment of Professor/Associate Professor/Assistant Professor jobs vacancies. Interested and eligible job aspirants are requested to apply with in 15 days. Check out further more details below. About College: KIPM –Technical Campus, GIDA, Gorakhpur is an institute with total commitment to quality and excellence in academic pursuits. It was established in the year 2009 under KIPM- College of Engineering and Technology provide, excellent quality of infrastructure to students. KIPM-College of Engineering and Technology also have a facility of comprehensive library for our students to study, with a wide collection of study material. The Institute is approved by the AICTE, BTE Lucknow and is affiliated to Dr. A.P.J. Abdul Kalam Technical University, Uttar Pradesh, Lucknow. We also have ISO 9001:2008 QMS certification for all our courses.